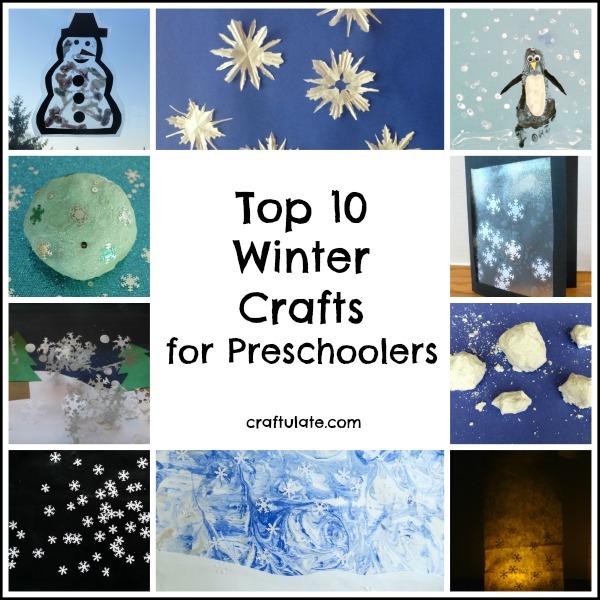 These winter crafts are perfect for preschoolers! Little kids will love these snowflake and snowmen crafts! So many different ways to celebrate winter! Super simple – and little ones can make some basic designs if you fold the liners for them. This activity uses a marbling technique and paper punched snowflakes for a dramatic effect! These are so adorable! And they look wonderful up at the window catching some winter sunshine! We *love* making handprint and footprints! These penguins are adorable! These simple greeting cards are so easy for tots to make! This gorgeous play dough is sparkly and beautiful! This is a VERY frugal winter decoration that also works on fine motor skills! Don’t have snow of your own at winter? Make your own for some fun sensory play! This activity uses black contact paper instead of glue for a mess free experience! Here are some more fantastic ways to celebrate winter with kids! Some great ideas for getting us in the winter mood while the weather is so freakishly warm!